Holly Chayes » If you have a wardrobe of 27 pieces, how often do you wear each piece? hi holly! I´ve been reading your blog and loving it! I think calculating percentage days worn over days owned, is unfair to the older pieces. Because even though you wore them a lot, when a new garment appears it monopolizes your attention, so garments appearing at the end of the year have an unfair advantage, because they didn´t have to share your attention with other newcomers. For example, I think you did wear the blue kimono a lot at the start of the project. But then all those new sweaters happened, and then the Archers. And there is seasons too. 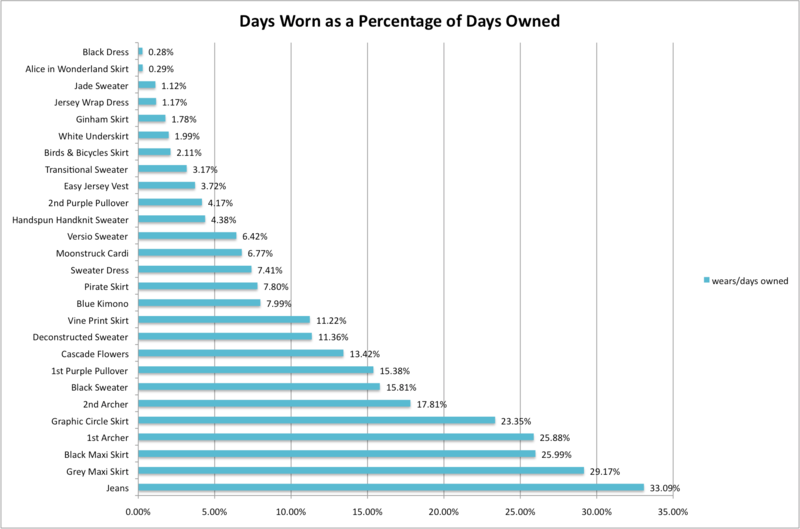 You could compare days worn in a year starting from day one of ownership, .but when you incorporate your clothes from before the experiment that will affect the conditions too. What’s impressive is the black maxi skirt, one of the first garments made, yet the second highest percentage. It’s funny because I would have thought the skirt you had worn most was the flower cascade. I guess it´s true that you don´t really notice as much when neutral basics repeat. Thank you so much for reading – I’m glad you enjoy the blog! It’s definitely true that when a new piece of clothing entered my wardrobe I tended to favor it for awhile because it was new, (and the thrill of new clothing is even more thrilling when you didn’t just go out and buy something). 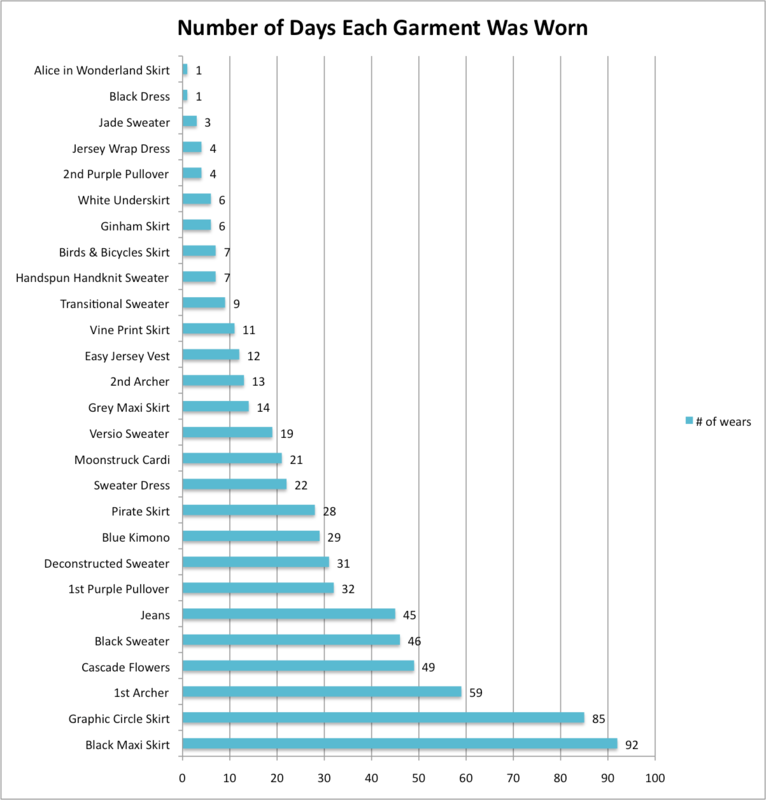 So as the final graph in the post shows, my jeans and grey maxi skirt have the first and second highest percentage of wears/days owned and are also the newest pieces, but the next three pieces, my black maxi skirt, my 1st archer, and my graphic silk circle skirt, have all been around for awhile. 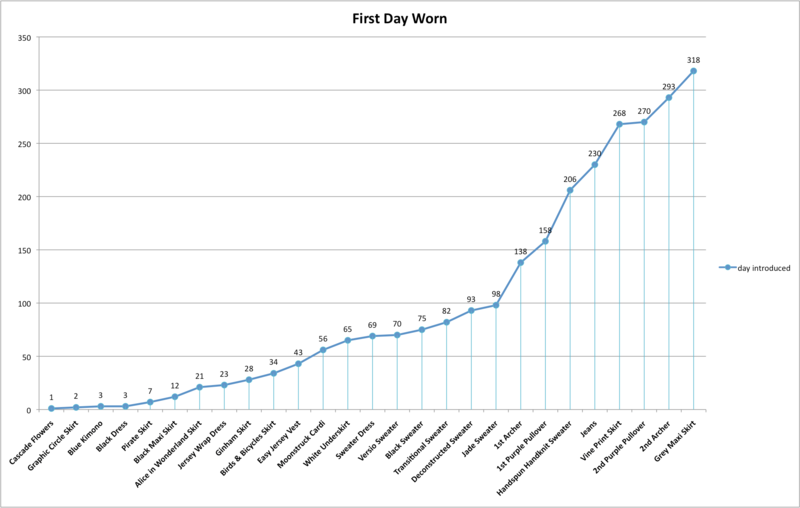 And from there, this graph is a fairly accurate representation of my favorite to less favorite pieces for daily wear throughout the past year – not 100% accurate, but not totally out in the wilderness. And I think it’s true that we forget exactly how often we wear our basic pieces, they sort of fade into the backgrounds of our memory. Before I counted, I thought I had worn the cascading flowers skirt more often too. Thanks so much for your comment! It was great food for thought. This is really fascinating, and not just because I love shiny graphs. I think it’s amazing you actually have the data on what you’ve been wearing for a year and it’s actually super useful to have these insights. Looking forward to seeing how much you spend ‘per wear’ on each item. I love all this number crunching! It’s really impressive that you wore pretty much everything you made. I sewed lots of clothes but I’d say I wore only half of them at all, and maybe only a fourth of them regularly. And even the successful ones, at some point I couldn’t wear because they no longer fit me. I made a lot of effort to learn how to perfect the fit of a garment, and although I followed the steps I didn’t get the desired result. In a sewing book I have it says that it would be easier to lose 5 pounds than to tweak the fit to allow for your extra weight! Yes, it really says that! I’m my case at one point in time my bust was a size 36, my waist 38, and my hips 42. The more weight I gain, the farther apart these numbers go. I think I’d sew more today if I had a higher success ratio of garments. I was pretty impressed I wore most of the things I made too, Keren. I think I had a couple things working in my favor when it came to wearing what I made. Firstly, it was kind of trial by fire, I started out with close to no made-by-me-for-me clothes, so if didn’t wear what I made, I didn’t have any clothes. Secondly, once I found a pattern/recipe that worked, I made a lot. For example, I have a bunch of yoked sweaters that are all basically the same pattern, with some tweaking. Same with skirts, they were all some sort of elastic waisted (usually long) skirt. Same with tank tops, and button up shirts. Thirdly, there were a couple pieces I ended up wearing (and loving) that I never, ever, ever, never, ever, would have picked up in a store, or worn if it weren’t for this project. And perhaps finally, I came into this project with piles of knowledge about fabric, and fit, and style, and tweaking garments that aren’t working, that I learned practicing on other people, which (I think) is a much easier way to learn how to sew & knit, then learning by making garments for yourself. Simply because I wasn’t having to distinguish between my sewing mishaps, and my body image issues. And there are actually about half a dozen made-by-me-for-me garments that I didn’t end up wearing at all, during this project. I hope all that makes some sort of sense. 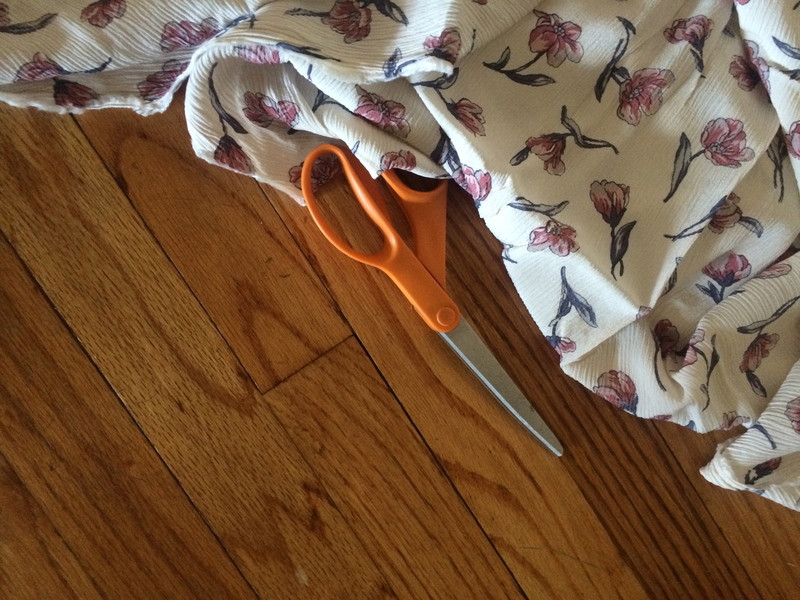 Mostly I’m trying to say that making wearable garments, for you, that you love, is a skill that you can only learn by screwing it up a lot – and the successes are totally worth all the failures. Keep going and you’ll get there.